Используйте этот Decrypter, если файлы были переименованы в * .crypted и вы нашли ransomnote с именем DECRYPT.txt на рабочем столе. Для использования Decrypter вам потребуется зашифрованный файл, по меньшей мере, 510 байт, а также его незашифрованный версию. Для запуска Decrypter выбрать как зашифрованное и незашифрованный файл и перетащите их на исполняемый файл Decrypter. Используйте этот Decrypter, если файлы были зашифрованы и переименован либо * .hydracrypt * или * .umbrecrypt *. Используйте этот Decrypter, если ваши файлы были зашифрованы и переименован в * .LeChiffre и ransomnote просит вас связаться с [email protected] по электронной почте. Use this decrypter if your files have been encrypted and renamed to either *.rdm or *.rrk. Use this decrypter if your files have been encrypted and renamed to *.CRINF. Используйте этот Decrypter, если вредоносная программа идентифицирует себя как CryptoDefense и оставляет выкупов ноты названные HOW_DECRYPT.txt позади. Используйте этот Decrypter, если файлы были зашифрованы с помощью вымогателей Xorist. Типичные расширения, используемые Xorist включают * .EnCiPhErEd, * .0JELvV, * .p5tkjw, * .6FKR8d, * .UslJ6m, * .n1wLp0, * .5vypSa и ​​* .YNhlv1. Ransomnote обычно можно найти на рабочем столе с названием "КАК дешифровать files.txt". Для использования Decrypter вам потребуется зашифрованный файл, по меньшей мере, 144 байт, а также его незашифрованный версию. Для запуска Decrypter выбрать как зашифрованное и незашифрованный файл и перетащите их на исполняемый файл Decrypter. NMoreira, also known as XRatTeam or XPan, is a file encrypting ransomware. It uses a mix of RSA and AES-256 to encrypt your files. Encrypted files have either the extension *.maktub or *.__AiraCropEncrypted!. In addition, the ransomware will create one of the following ransom notes. проверил расшифровку файлов на единственном пока примере. Encrypted file: E:\deshifr\_AiraCropEncrypted!\01\2\1sys_buh 2016-08-31 19;21;16 (Full).zip.__AiraCropEncrypted! Decryption: Successfully recovered encryption keys based on previous key. Could not guess key. Most likely the original file format is not supported. Encrypted file: E:\deshifr\_AiraCropEncrypted!\01\4\1sys_buh 2016-08-31 19;21;16 (Full).zip.__AiraCropEncrypted! Encrypted file: E:\deshifr\_AiraCropEncrypted!\01\4\Выгрузка каталога и коммерческих предложений на сайт в формате CommerceML версии 2.docx.__AiraCropEncrypted! Globe3 is a ransomware kit that we first discovered at the beginning of 2017. Globe3 encrypts files and optionally filenames using AES-256. Since the extension of encrypted files is configurable, several different file extensions are possible. The most commonly used extensions are .decrypt2017 and .hnumkhotep. To use the decrypter, you will require a file pair containing both an encrypted file and its non-encrypted original version. Select both the encrypted and unencrypted file and drag and drop both of them onto the decrypter file in your download directory. If file names are encrypted, please use the file size to determine the correct file. The encrypted and the original file will have the same size for files greater than 64 kb. Due to a bug in the ransomware, decrypted files smaller than 64 kb will be up to 15 bytes larger than the originals. This file size increase is due to the fact, that the ransomware rounds file sizes up to the next 16-byte boundary without saving the original file size. For most file formats this is unlikely to cause problems. However, if your applications complain about corrupted file formats, you may have to manually remove trailing zero bytes at the end of the file using a hex editor. Please keep in mind that there is a slight chance that this key might be wrong. We suggest trying decrypting a few files first to check whether it is working correctly. No active infection was found! MRCR or Merry X-Mas is a ransomware family that first appeared in December last year. It is written in Delphi and uses a custom encryption algorithm. Encrypted files will have either ".PEGS1", ".MRCR1", ".RARE1", ".MERRY", or ".RMCM1" as an extension. The ransom note is named "YOUR_FILES_ARE_DEAD.HTA" or "MERRY_I_LOVE_YOU_BRUCE.HTA" and asks victims to contact either "[email protected]" or "comodosecurity" via the secure mobile messenger Telegram. To start the decryption process you will need a file pair consisting of an encrypted file and the non-encrypted version of the same file. The files need to be between 64 KB and 100 MB in size. Select both and drag and drop them onto the decrypter executable to start the process. в данной версии дешифратор неудовлетворителен, по крайней мере не для всех заявленных расширений (в частности для *.RARE1) работает корректно. Three days later, on Saturday, January 28, Emsisoft suffered a similar fate, when a DDoS attack hit a specific section of the company's portal, the place where Emsisoft hosts ransomware decrypters. Speaking to Bleeping Computer, Emsisoft's CTO Fabian Wosar said the attack clocked in at around 80 Gbps, and its defenses held up just fine, with no downtime to its website. "They didn't manage to take the site down," Wosar said. "According to our provider it was a smaller attack of about 80 GBit. It was [...] kinda slow." 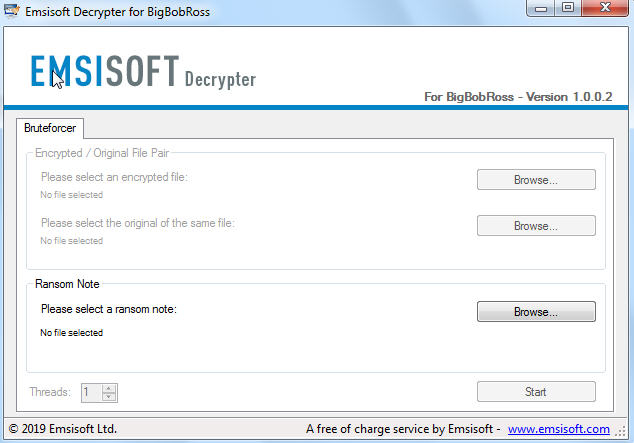 Today, Emsisoft CTO and Malware researcher Fabian Wosar released a free decrypter for the CryptON ransomware family, allowing those that have been infected to free their encrypted files without having to pay a ransom. 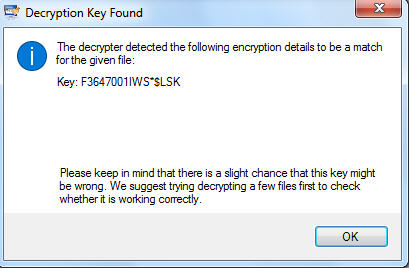 Variants of the Russian-originated CryptON ransomware, such as X3M and Nemesis, started to appear on the Bleeping Computer forums from December 2016. All of them seem to be put together using the same “builder”, a term that describes a software application which automates the process of customizing a malware executable. дешифратор (for Damage) рабочий, ключ в итоге по паре чистый - зашифрованный был вычислен, и все файлы были корректно расшифрованы. 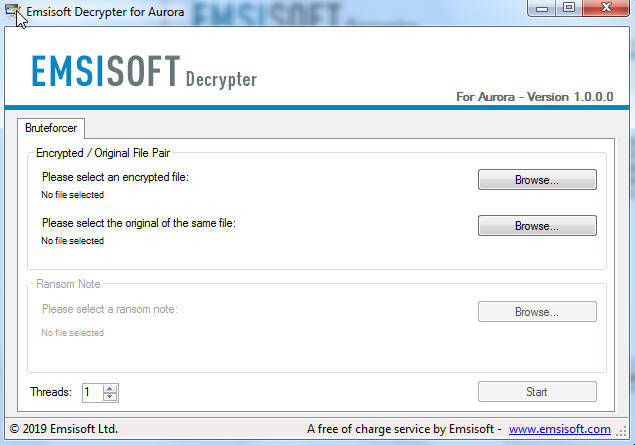 On Saturday, Emsisoft's CTO and malware researcher Fabian Wosar released a decryptor for the Amnesia Ransomware. This ransomware was first spotted in early May and has had one other variant released called CryptoBoss. This family of ransomware was named Amnesia based on the extension appended to encrypted files by the first variant. (ключ предварительно был получен от вирлаба). - ("минус") в том, что опция "/a" вычисления ключа по группе зашифрованных документов не работает в ESETFilecoderQCleaner.exe. Т.е. ключ расшифровки для данной утилиты можно получить только в вирлабе. [2017.09.16 15:17:15.664] - .::EEEEEE:::SSSSSS::..EEEEEE.....TT..... Copyright (c) ESET, spol. s r.o. [2017.09.16 15:17:15.664] - ..::::::::::::::::::.................... 1992-2015. All rights reserved. [2017.09.16 15:17:16.241] - INFO: 26 infected files found. [2017.09.16 15:17:16.241] - INFO: 26 file(s) cleaned. отключил проверку жестких дисков (только съемные), но утилита на это почему то не реагирует. BigBobRoss is a ransomware written in C++ using QT. It uses AES-128 ECB to encrypt files, and adds the extension ".obfuscated". 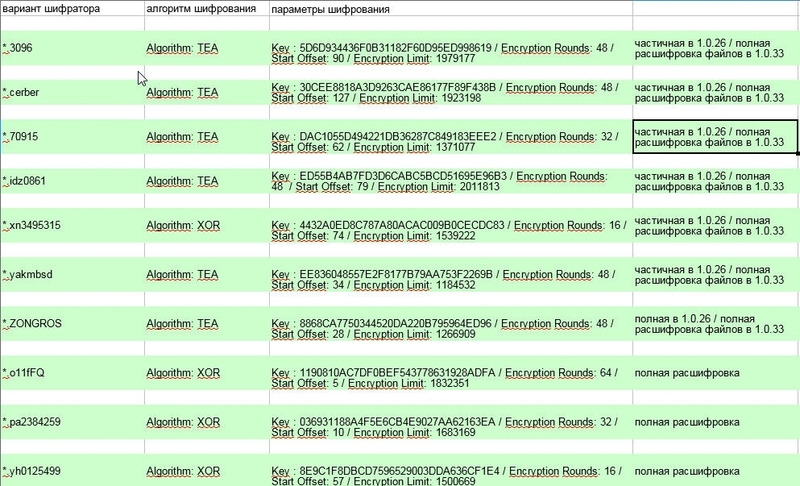 Some variants also prepend the victim ID to the filename. The ransom note "Read Me.txt" asks the victim to contact "[email protected]". видим, что в возможно вычисление ключа по записке о выкупе. PewCrypt is a ransomware written in Java that uses AES and RSA to encrypt a victim's files, adding the extension ".PewCrypt". The malware then asks the victim to subscribe to PewDiePie. The author supposedly released this as a "joke" in 2019 - but be assured, ransomware is no joke, ever. 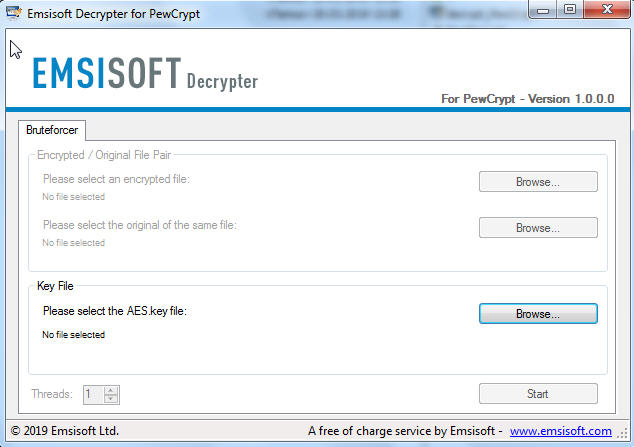 To use the decrypter, you will require the "AES.key" file left on the desktop by the malware. 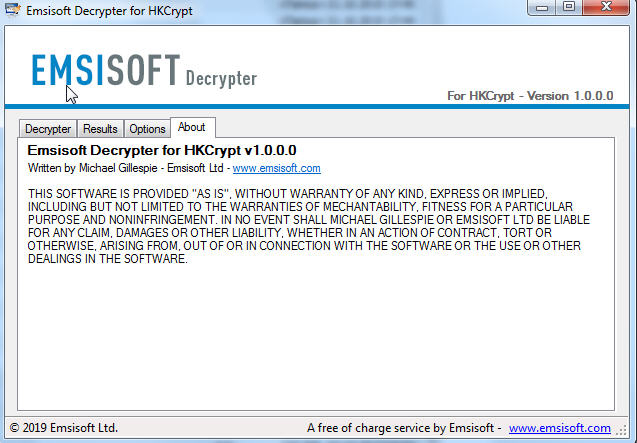 HKCrypt (also known as "Hacked Ransomware") first appeared in late 2017, and encrypts a victim's files using the RC4 algorithm, then adds the extension ".hacked" to files. The malware pretends to be running a Windows update, then shows a lock screen telling the victim to contact "[email protected]". 2.после некоторого перерыва, Emsisoft вновь активен в создании новых дешифраторов. Aurora is a ransomware family that encrypts files using XTEA and RSA, and may also be known as "Zorro", "Desu", or "AnimusLocker". Known extensions include ".Aurora", ".aurora", ".animus", ".ONI", ".Nano", and ".cryptoid". The malware leaves many ransom notes, examples include "!-GET_MY_FILES-!.txt", "#RECOVERY-PC#.txt", and "@[email protected].txt". 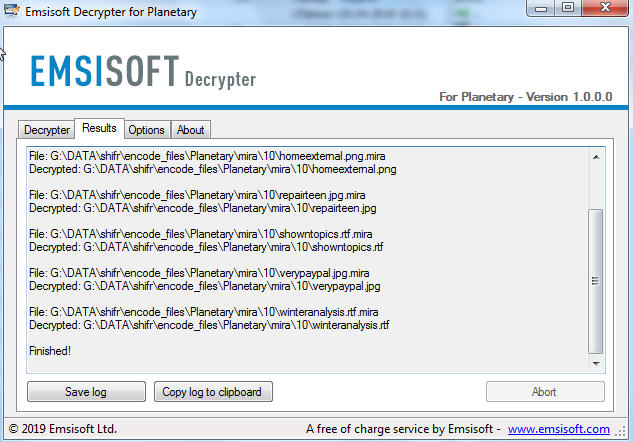 Planetary is a ransomware family that uses AES-256 to encrypt files, adding the extension ".mira", ".yum", ".Neptune", or ".Pluto" to files - the latter of which give this ransomware its name. The ransom note "!!!READ_IT!! !.txt" then asks the victim to contact "[email protected]". На этой неделе Emsisoft выпустил расшифровщик для семейства Planetary Ransomware, который позволяет жертвам бесплатно расшифровывать свои файлы. Это семейство вымогателей называется Planetary, потому что оно обычно использует имена планет для расширений, добавляемых к зашифрованным именам файлов. При шифровании файлов к имени зашифрованного файла добавляется расширение .mira, .yum, .Pluto или .Neptune. Например, если файл с именем test.jpg был зашифрован, он будет переименован в test.jpg.Pluto. CryptoPokemon uses SHA256 and AES-128 to capture victim's files, and adds the extension ".CRYPTOPOKEMON". The victim is then presented a ransom note and website claiming to be "PokemonGO".